Costa Rica's climate is overall tropical, with two seasons, dry and wet - often very wet. The dry season in Puerto Limon runs from December to April and the rainy weather begins in May, continuing until November. During the rainy season, mornings are usually dry and sunny, with rain falling in the late afternoon and evening. Temperatures are stable, with little variation during the year due to the country's close proximity to the equator. Sunshine throughout the year averages ten hours per day, with sunset at about 18:00 consistently, again due to the proximity of the equator. Average temperatures are around 27°C / 81°F, with the cooler period in the winter months and the increased heat in March to May affected by the high humidity. 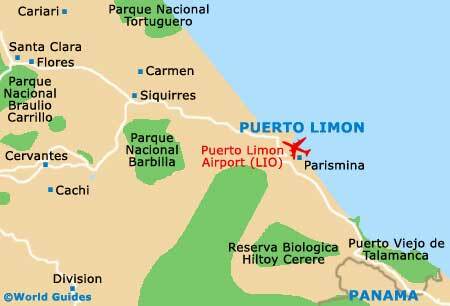 Variations in Puerto Limon's climate are connected to its elevation above sea level - low-lying areas may be dry and sunny, while on nearby mountains there is day-long mist and dampness. Costa Rica's Caribbean coast has a unique micro climate which keeps the weather hot and humid almost all year, with daily rainfall. Due to the year-round warm climate, holidays here can be great whatever month you arrive in. If sea, sun and water sports are on the agenda and the Caribbean coastline is the destination then, apart from regular showers, any time is a good time to come. If travelling around the region by hire car from San Jose, it is best to avoid the heaviest rainfall months of November to January and April to August, as roads in the interior can become impassable, even with a four-wheel drive. If eco-tourism is your thing, April through October is a good time to visit Puerto Limon, since the breeding turtles come onto Tortuguero's beaches at this time. If you are planning to tour the entire country, including the mountainous central areas, remember that it will be a lot cooler at night on the heights, so bring a warm sweater or a coat with you, as well as an umbrella! If you are planning to be here in hotter parts of the year, sun-block will be necessary and you should be sure to drink water regularly to avoid dehydration.